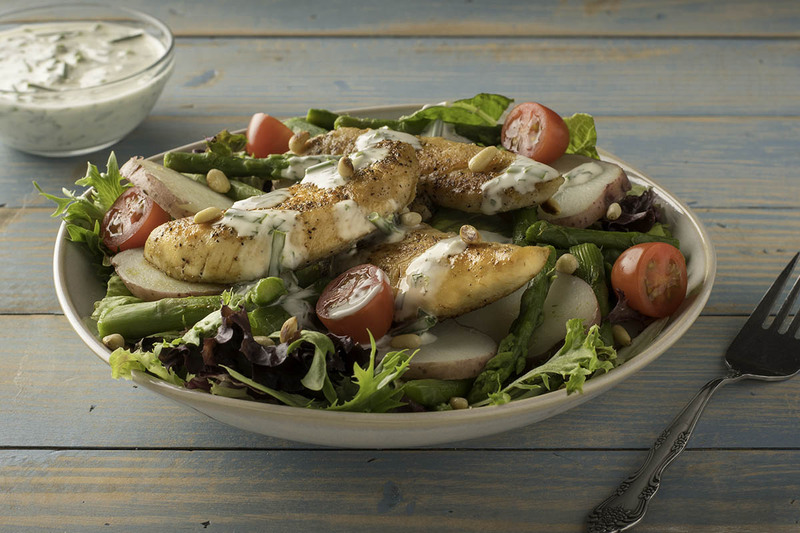 This spring-inspired chicken salad features fresh asparagus, new baby potatoes, bright salad greens, and a creamy tarragon and chive dressing. To make dressing, stir together all dressing ingredients in small bowl. Cover and refrigerate at least 1 hour or up to 3 days. To make the salad, fill a medium saucepan half full with cold water. Add 1 teaspoon salt and potatoes. Bring to a boil; reduce heat to simmer. Cook, uncovered, 15 minutes or until just tender. Remove potatoes from water with slotted spoon. Chill. Cook asparagus in the same simmering water 5 to 6 minutes or until just tender. Drain and chill. Heat oil in large skillet over medium-high heat. Add chicken tenders; sprinkle with 1/2 teaspoon salt and pepper. Cook about 10 minutes or until lightly browned and thoroughly cooked. Chill. When ready to serve, arrange 2 cups of salad greens on each of 4 large plates. Top with 1/4th of potatoes, asparagus, chicken, and tomatoes. Drizzle with dressing. Sprinkle with toasted pine nuts. To toast pine nuts, use a small skillet over medium heat for about 4 minutes, stirring occasionally.